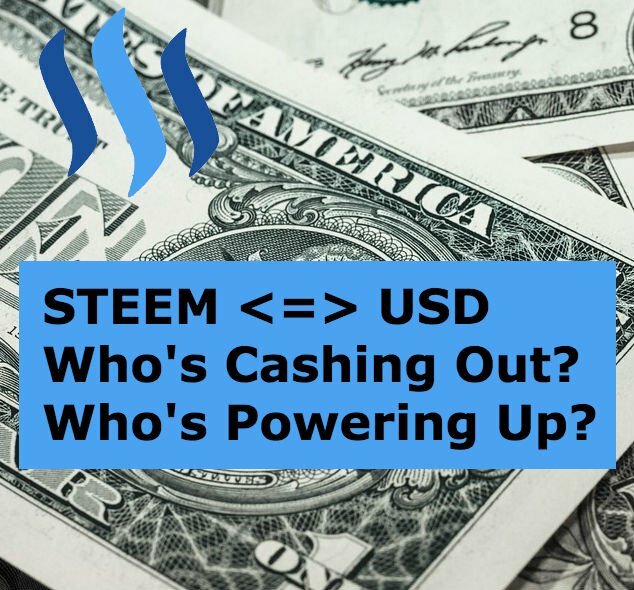 Steemit Money: Who Is Cashing Out? Who Is Powering Up? I've been active on Steemit for one month now. To say I've been fascinated with the money side of Steemit would be an understatement. I gave away 465 SBD to people who answered the #bitcoinpizza challenge of "Where does the money come from?" I wrote about a script to hide the $ amounts on the website, which I used for 24 hours here and here. I mentioned how a single founder was positioned to make $700k a week, if they powered down their Steem Power. I talked about the Steem Power "interest rate" here and here (it's not really an interest rate, but more accurately a protection against share dilution). On the net, are more people buying into Steem Power with real money or are they cashing out their STEEM and SBD for real money? The answer to this question, I think, is really important because it will be an indicator for the health of the STEEM cryptocurrency. If too many people are dumping beyond what the demand for STEEM is, the price will go down. If a lot of people are buying and powering up, the price will go up as liquid supply goes down. That would also indicate a demand for Steem Power and influence on the network. I ran this for each account to create three text files. From there, I modified the data a bit so it only includes transfers from 7/31/2016 to 8/6/2016. Then I worked the data in PHP to keep track of the transfers to and from the exchanges to figure out the net amount going from an account to an exchange (which is a strong indication they are selling their STEEM/SBD for BTC/USD) or from an exchange to an account (a strong indication they just bought some STEEM/SBD to power up). Now, these numbers might surprise you. There has been a lot of talk about Steemit being a scam or a ponzi scheme. There's also some who realize the importance of start up capital and portfolio diversification. Before showing the raw data, I'd like to give my thoughts on these points. Not likely, IMO. Years and years of development efforts and expertise have gone into building this platform. Every indication I see points to this being a long-term play. From a certain perspective, life is a ponzi scheme. To me, the only way this one makes sense is if the value of Steem permanently crashes in the future (and was intended to do so) and those who invested later can't get their value back out. If the value does go down, it could also just be seen as a failed investment. I don't see any indication this was specifically designed as a Ponzi Scheme unless the large holders are able to power down so much as to destroy the market before others can ever gain value. So far, IMO, the whales are too rational for this to happen as it would also destroy the rest of their value in this platform which might be worth much more in the future. I see this as a good thing! If the market can bear it, this means STEEM/SBD is being distributed to more people interested in buying it. This means the centralization of wealth problem is diminishing. It also means those people are smart, rational actors. If they had a net worth of, say, $5k before the STEEM price went way up, and now they have, say, a networth of $1M, any financial advisor worth a damn would be screaming for them to diversify because more than 99% of their wealth would be in one place. This, I think, is important. Companies growing at this rate need capital for operations, marketing, support, and development. If they weren't obtaining spendable real-world currency to pay for the things they need to grow, we should all be worried about the future of this platform. This, I also see as a good thing, provided Steemit is not a scam or a ponzi scheme. As people buy STEEM/SBD, the demand goes up which drives up the price (or supports the current price) of STEEM. That benefits everyone who is powered up and believes in the long-term value of Steemit and will provide more motivations to continue creating great content and inviting their friends to join. This is the output of a PHP script I wrote which analyzes the three files created via Piston. I may open source it after getting feedback from this post and to ensure I didn't screw something up (which is very possible). As you can see, some accounts are dropping some serious money into STEEM. 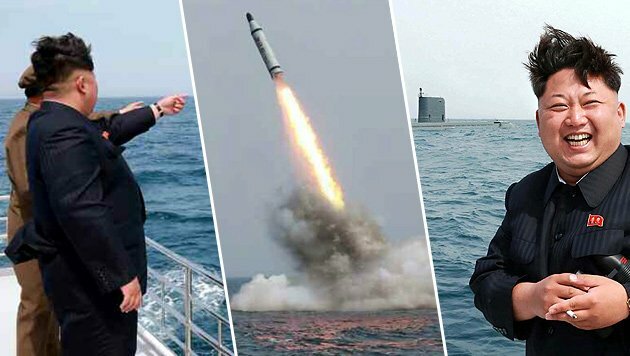 Also, Steemit, as a company, is cashing out some big money as well, along with some whales. What does this mean for the future? I don't really know, but it's something I plan to keep a close eye on. I understand this is a sensative subject. Some may prefer this information not be so easily available (you don't publicly broadcast your bank account balance or your investment portfolio changes, do you?). At the same time, this is a public blockchain and, IMO, people should be making informed, rational decisions about whether or not they want to invest in this platform over the long term. Data like this can help people make better decisions. If your first reaction to this data is envy at other peoples' success, please don't bother commenting. That negativity won't cause you or anyone around you to prosper. If you appreciate this, I'll consider doing it every week. Give me a follow to stay informed. Last time I looked a few days ago, the @steemit acct was transferring STEEM to secondary accounts (including @steem, the account that is creating all the new "free" accounts), and Blocktrades, which I presume is going there in exchange for the BTC collected for on-site STEEM buying and powering up. There are some that don't like to see the larger players cashing out, but of course they're going to cash out. I'm not whale status but I am divesting some of the STEEM from Steem Power. However, my total VESTS have been increasing at the same time from posting rewards. I haven't re-powered down after earning probably 30 Mvests in the last month or so. As you say, it's healthier for Steem long-term for there to be a smoother distribution. Yes, I've noticed the other steem accounts as well. It seems one was used to distribute refunds as well, maybe due to the hack? Interesting stuff. I haven't yet thought through how I could account for the "free" accounts being given out, because I think that would also be a really interesting number to track over time. Thanks @pfunk! Definitely will be checking this out further, I am curious to see more data than last week to compare the highs vs the lows. I just posted the latest report and played with the code a bit. The past month, as an example, shows a total withdrawal amount over $1M. Let me know if you want specific data. I also totally agree that the whales powering down is a good thing, as it distributes wealth better in the long term. You will also notice that most witnesses are powering down, and there is an important reason why -- these people are being paid for their duties in STEEM Power as a witness, and are powering down to cover the cost of their activities. For example, many are working on the website, @pharesim is working on the #pevo project, some are doing marketing, and so on. So of course they are powering down! This is actually some sort of blockchain investigative journalism and I DIG IT! Thank you! I've been wanting to do more of this for the whole month I've been here, but I haven't made the time until last night. I had a lot of fun writing the code for this, and I'm already thinking about other improvements I can make. To me, the only way this one makes sense is if the value of Steem permanently crashes in the future (and was intended to do so) and those who invested later can't get their value back out. If the value does go down, it could also just be seen as a failed investment. Remember that value alone is not an indication because the number of STEEM one has may multiply if they are power up. So what we are looking at is our holdings value. Obviously if you have 1000 SP at 2$ and 10.000 SP at 0.3$ you don't care about the price "crashing" because you've compensated by the increased amount over time. Thanks a great point, thank you @alexgr. When I say permanently crashes, I mean closer to zero, but your example brings up an important point in that the price per STEEM can go down significantly, but if the amount of STEEM you can obtain via Power Down is increasing to the point where you could still sell (even at the lower price) and regain your value, you'll be good to go. The issue, I think, would be the potential for a downward spiral. If more people have more and more tokens that are going further down in price, the demand might get even smaller which would further shrink the price. It's going to be very interesting to see how this all develops over time. b) it would allow the purchasing of all steem at ...near zero cost - and by extension the control of the platform at ...near zero cost. It would take a serious flaw or a very strong competitor to allow this to happen. Otherwise I'm not particularly afraid of the ever diminishing price / downward spiral, as a buyer will also have to buy an ever-increasing amount of steem tokens to acquire the same voting weight. I think the biggest hurdle, as time evolves, is the ability of the platform to scale its rewards. This is a crucial point for the platform to succeed, but I'm skeptic on that department due to marketcap being unable to follow the explosive growth of the userbase. The userbase could go 100x to 5mn, but can marketcap go 100x to 20bn, so as for rewards to stay consistent? I think not. Even at 10x (2bn marketcap), with 5mn users we'd have /10 rewards among the users, because they'll have multiplied x100 while the reward pool only increased by 10x. So that's an issue. a buyer will also have to buy an ever-increasing amount of steem tokens to acquire the same voting weight. The interesting thing about the marketcap number is, to me, it's not a "real" number. Unlike the other cryptocurrencies, those coins are not liquid. So, given that the number isn't real, I can imagine it going quite high using the current mechanisms for calculating the number. If you just use liquid STEEM, the marketcap looks much smaller and 100x may not be that big of a deal. I also don't think the rewards will stay as high as they are now, but I'm hoping for more $5 posts instead of a handful of $15k posts and a sea of $0.01 posts. As the Steem Power gets distributed around, I think we'l see this happen more. I'm also okay with the approach because it means early adopters would be rewarded more for the risk they took. @bacchist wrote a good post on the marketcap number you might like. This is a great point. If the price were to ever get too low, the cost to purchasing substantial influence would be trivial. I think the site has already grown to the point that influence over the front page would be worth a lot to some people. One of the major things I love about this platform is the open nature of it all. You can look at any profile and see transaction and totals. You can write scripts that drill into all if this available data. Look where it is taking us and look what people can achieve, obviously including yourself!! A tiring aspect of the modern age is the repressive secrecy around everything but not with steemit!! Well apart from the elusive and much rumoured white butterfly theory..
Oh feck man, I just looked. I can't shake the horror out of my head! I feel like this is a set up, but... the white butterfly theory? Very interesting - thanks for compiling all of that data into a useful glimpse of the times. Will be interesting to track the ebb and flow (assuming that happens) of those opting to power up as they reached certain taxation thresholds. This will be the 'problem' going forward for those cashing out large sums - identies often exposed making it rather hard to stay in the shadows. Yeah... I was already talking to a friend about Puerto Rico. If things really got big... might not be a bad option. Wow, nice. Some awesome scripting magic to get all the relevant stats. I will be keen to keep an eye on your continued findings. I only joined Steemit about 3 weeks ago and it has been fascinating. I hope Steemit can continue to grow and become a great success. Thanks! I'll probably run another report tomorrow covering the past week. My hunch is we'll see a lot of cashing out, which will explain the price drop in STEEM we've seen lately. Thanks! It may sound like a lot of money, but keep in mind around $1,000,000 in new bitcoin is minted Every. Single. Day. If the market can support that, there's probably quite a bit of room for STEEM. Very nice work. There is a lot of information here. Thanks for the insight. The openness of the blockchain is a wonderful thing, but at moments a bit uncomfortable/weird/unusual as well. :) I'm completely new to steemit and its ecosystem, but I stumbled across @bitcoiner's http://steemdown.com/ yesterday. A bit similar to yours. Yeah, I like that site as well. The difference for me, I think, is that a power down doesn't automatically mean they are going to sell to an exchange. It could also mean they need liquidity for an OTC trade or to spread some Steem around to other accounts. The post I mention above about Ned powering down was an interesting case because right before the power down went through, they cancelled it. So it could be a false signal where as a transfer to an exchange is a stronger signal, IMO. Sorry for the typo. sensative should be sensitivebut I'm getting an error in my browser when I hit the edit button. Not a very bullish signal short term. Would love to see this weekly. Thanks! I'm tempted to spend some time and analyze the data further back, especially while the price was rising above $4. That would definitely be telling to know the ratio during that time. The other thing to consider is the long-term vested nature of SP as a prop for the value of Steem. Even though more is being sold than being bought, SP backstops the value of Steem; not to mention all of the value being created and new people jumping on board. Check the latest report for the updated ratio. It actually went down a bit. Thanks for the feedback. The comments so far indicate people would value this information, so I'll probably keep doing it. I haven't gotten any whale votes, so that may mean they don't approve... but no down votes either. We'll see how this shakes out. Thanks again. I just posted the latest report if you want to check it out. Great analysis. It will be very interesting to see how these numbers look long term. Very good, I have gained additional insight into how this works, or will work. Thank you for the post. What do you mean? If you're talking about powering down, you get a portion every week for two years. I agree it will bring stability, but ultimately it comes down to supply and demand. If people aren't buying STEEM and SBD, the price will go down as people attempt to sell their earnings. Thanks Tim! I appreciate the follow. Thank you for such compiled investigation . Very well done Luke . Very helpful . I keep on collecting my few cents and $$ . I would like to see more reports and how it looks in one month from now . The latest report is fresh off the presses if you want to check it out. Any data about @openledger? And perhaps another exchange? Thanks for the comment, @abit. I forgot about that one! Is there a place I can get all the exchange Steemit accounts? I understand there will also be OTC trades we can't see, but I do think this stuff is super interesting to look at. I think I'll run it again this weekend and I'll add @openledger for sure, along with any others you can point me to. I've got the code in a place right now where added exchange accounts is no big deal. I also want to improve it a bit to be date-based as far as how many transactions it pulls down. Right now, I have to manually message the data a little. I'm surprised some of the data comes in out of order as well as far as the date range goes... not sure why that is. Maybe it has to do with the technical aspects of how and when blocks are confirmed. Thanks, I noticed they have a number of accounts listed there I wasn't aware of. I'm not sure what all their Steemit user names are though. For this week's report, I did add @openledger. I added @openledeger to the latest report. Are there any others you'd like to see? Great stuff! Congrats. I'm so glad Steemit is helping your family prosper. Any update on the ratio of sellers to buyers? This is something I'd love to see a regular post on. My plan was to run an update tomorrow so I could include another full week of data. I want to update the code a bit so I can query by dates instead of having to manually adjust the files. Great post! Thank you for giving us all the benefit of your programming skills. I realize this is an old post, but it's very interesting. "...this is a public blockchain and, IMO, people should be making informed, rational decisions about whether or not they want to invest in this platform over the long term. Data like this can help people make better decisions." I think you're exactly right. I have very little money, and I'm nearing 60 and having health problems. I've had one surgery and I'm getting ready for a second, and I may not be able to work anymore. I do have a bit of Bitcoin, and I was about to purchase Steem with some of it, so I need this information to make a rational decision. Honestly, after reading your other article that linked here, and seeing this one, I'm very worried about Steemit's future. I believe it may be a Ponzi Scheme, but with no schemers, because it wasn't intended to be that way. It'll just be the way it goes. I guess the setup of it makes it a natural pyramid scheme by design, but again, with no one intending for it to be anything other than a great site that would last forever. I just don't understand how it can be sustained. If I invested part of the very little Bitcoin that I have, I'd be thinking, "I have to try to get in and make some money before everything comes tumbling down." I want my investment to grow and be secure, obviously, the same thing everyone else wants. Truthfully, I believe that if anyone saw this and your other article before they invested in Steem, it would turn them away. It's kind of like if you spend more than you earn, eventually things will fall apart. I got in trouble with credit cards many, many years ago, and I was taking cash advances on one card to pay the bill on another, and transferring balances to new cards with no interest for 6 months, but it obviously, eventually crashes. Without an injection of a large amount of cash, there can be no other outcome. Am I misunderstanding this? I'm a financial idiot. I really want Steemit to survive, and I really want to invest, but I'm seriously having second thoughts. I Power Up everything I make on Steemit, which is a very small amount, but I just don't know if the heavy drain can last without bringing everything down, even if the smaller accounts are Powering Up everything, and I'd bet the overwhelming majority of them are. Those huge account owners can withdrawal large sums of money, but while having the power to continue to replenish their Steem supply in order to keep it going. Obviously, the people that have those accounts with that much Steem in them, are able to do what they want, but it's scary. I'll like to try this myself. I love learning and experimenting.